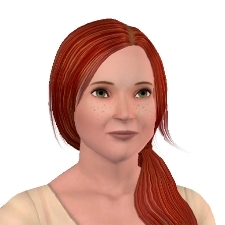 Because I am insane, I am starting a third Sims 3 challenge blog. Welcome to Waypoint, a place for sims to stop on their way to a better life. This one is a Nothing is Free challenge combined with a Six Degrees of Separation story. Details are in the About page for the curious. One thing to note is that succession is not determined by genetics, so it’s technically not a legacy. Households are actually going to switch with each passing of the torch. That also means that I’m going to have very little control over the traits of my patrons, though I can choose an heir I want to play, and I reserve the right to use the Midlife Crisis reward. I don’t expect this challenge to have any polls other than silly random ones. Our foundress is my simself, Echo Weaver. It’s about time she got a chance to have a story of her own. Her lives have been pretty unhappy in every game I’ve dropped her. I think Twallan’s StoryProgression really has it in for Hopeless Romantics. Her traits will be tweaked to suit the environment. It doesn’t, for example, make a whole lot of sense for a sim to have Computer Whiz on a desert island with no electricity. I expect this to be a fairly slow-moving blog because I have two other sims challenge blogs, and there’s only so much time to play and blog for normal humans who need to sleep. Clearly I need to become a vampire. Or an alien. This challenge kicks off approximately with the release of Island Paradise, so watch this spot for more excitement! I'm so excited to see the NiF in action! Plus, it's awesome that Echo gets her own story now! I still think you're a little crazy, though. I'm clearly crazy, and I HOPE I can pull it off. One thing about NIFs is that they have no completion criteria. I just develop the world as long as I like. OTOH, Six Degrees of Separation really wants you to do six patron sims. I'll see if I'm actually going to do that. This sounds very intriguing and I can't wait for you to get started. I haven't seen any NiF challenges in action, plus it'll be set in Island Paridiso. I take it Echo's not going to be a mermaid? Sigh. Yeah. Aliens don't sleep. That would help a lot. Echo won't be a mermaid, but I expect there to be mermaids and plantsims in this game eventually. I love this – a third challenge blog! It makes me feel better about my Sims obsession..
Hee! It's a lot of fun to have a simself. I have unleashed poor Echo in the town in both the Samples and the Wonderlands, and in both cases she's had a truly miserable life. In the Samples, she's been engaged at least twice and dumped both times. In the Wonderlands, she was engaged to Ayden van Gould, and he dumped her with his love child. And then Twallan's StoryProgression fills up my notifications with stories of her stalking all of her ex-boyfriends. SP hates the poor girl.